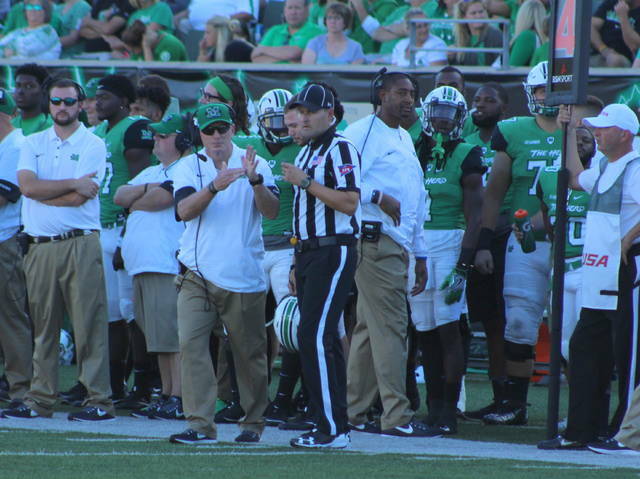 Marshall football coach Doc Holliday signals for a timeout during an Oct. 14 football contest against Old Dominion at Joan C. Edwards Stadium in Huntington, W.Va.
HUNTINGTON, W.Va. — Those dreaded turnovers. Visiting Florida International scored 17 points off of a trio of Marshall turnovers Saturday and rolled to a wire-to-wire 41-30 victory in a Conference USA East Division gridiron contest at Joan C. Edwards Stadium. The Panthers (5-2, 3-1 CUSA) benefited from a MU fumble on the second snap of the game that led to half of a 14-0 first quarter advantage, but the Thundering Herd (6-2, 3-1) rallied to cut the lead in half after a 15-yard touchdown pass from Chase Litton to Willie Johnson for a 14-7 contest with 7:37 left until halftime. FIU responded with 14 straight points to take a 28-7 cushion into the break, then Brad Muhammad return an interception 15 yards to give the guests their largest lead of the game at 35-7 with 6:11 remaining in the third. The Green and White closed to within 38-30 with 2:44 left in regulation, but a failed onside kick and a Jose Borregales 38-yard field goal with 26 seconds left allowed the Panthers their best start in program history. The Thundering Herd outgained FIU by a 505-401 overall margin in total offense, but the minus-3 turnover differential certainly played a part in the final outcome. Litton was picked off twice and also three three touchdown passes while finishing the afternoon 33-of-52 for 363 yards. Tyre Brady also had nine grabs for 101 yards and a score, while Keion Davis led the ground attack with 85 yards on 11 carries. Florida International outrushed the hosts by a 224-142 margin in yards and also controlled possession for 31:57 in the contest. A complete recap of the FIU at Marshall contest will be available in the Tuesday sports edition of the Point Pleasant Register.